I've been using roses in my meme post this week, so here's some more. Our sky has been overcast and/or raining this week. This photo was taken on Wednesday with my cellphone, here in Murrieta. To visit other participants go to Skywatch Friday. Jan, this is gorgeous!!! Love the sunlit edges and that dramatic sky. I like the photo very much! Great contrast of colors. I love how to took the shot from below!! So very beautiful! Great capture! Might be cloudy, but I love the variation in the colour of the sky! And the roses, too!! Such a great shot with a cell phone!? Wow--just proves the old adage that its more important who's behind the camera than the camera itself. 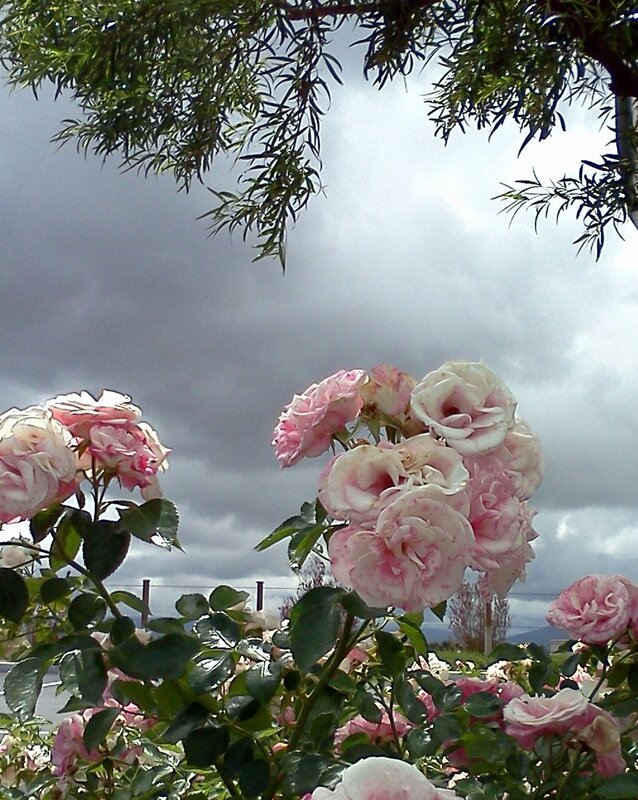 Even with the cloudy skies above your roses look lovely! Beautiful sky + beautiful flower = perfect picture. Pls visit my entry. Happy Sky watch! I love roses! Ours aren't even budding yet ... late this year. I like the way you included the dramatic cloudy sky with just a hint of sunshine. P.S. Your heart was featured on this week's Guest Heart Thursday! Your cell phone takes great images!! Such a pretty rose. What kind is it? beautiful photo and I just love the roses. The color is gorgeous.